 Resource Guarding in Dogs: How to Stop Attacks & Food Aggression in Dogs? Does your dog growl or bark when other dogs approach their food bowl, bones, or a coveted spot on the sofa? Do you have to feed your dogs separately to avoid a conflict? Is resource guarding between your dogs causing you stress and anxiety? Resource guarding is a common behavioral problem, especially in multi-dog families. It’s totally normal for dogs not to want to share valuable resources. In fact, it wasn’t that long ago that their very survival depended on protecting their food and belongings from other animals. But just because a behavior is normal doesn’t mean you have to accept it. Dogs who guard resources can be unpredictable, and dangerous situations can result from the behavior. This article will introduce you to resource guarding between dogs and help you take steps to manage and correct the behavior. 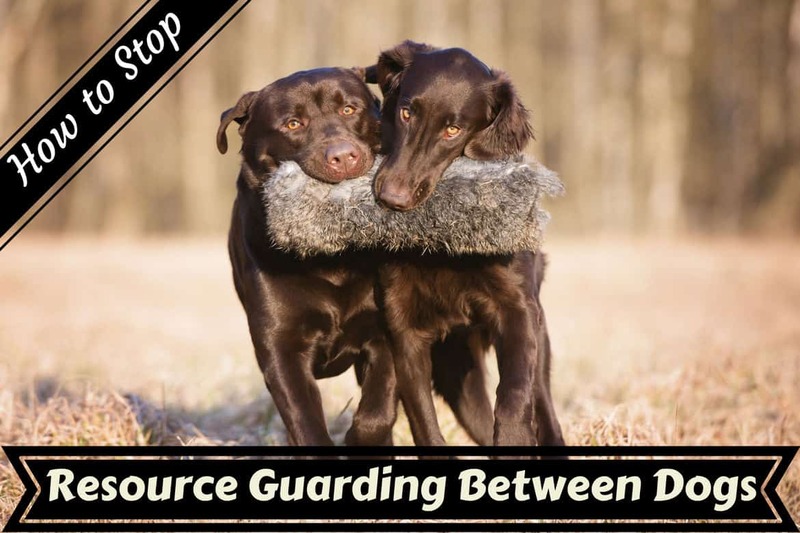 What is Dog-to-Dog Resource Guarding? Why Do Dogs Guard Resources from Other Dogs? 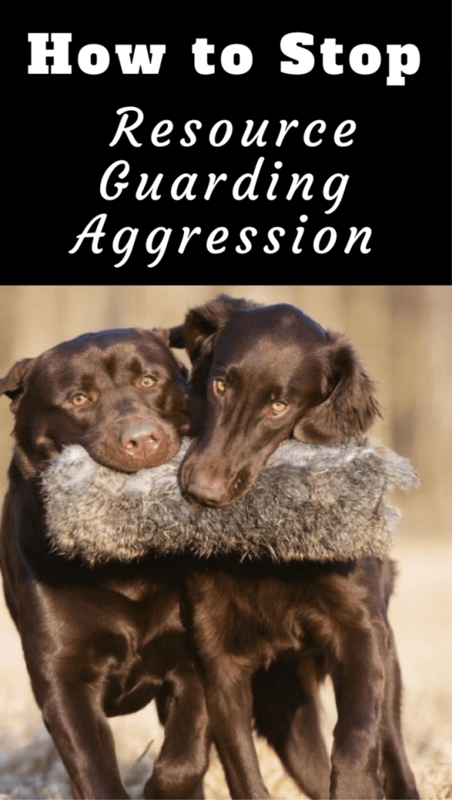 Resource guarding, or possession aggression, as it is sometimes called, occurs when a dog tries to protect a coveted “resource” from another dog or person. A resource is anything your dog finds valuable enough to protect. 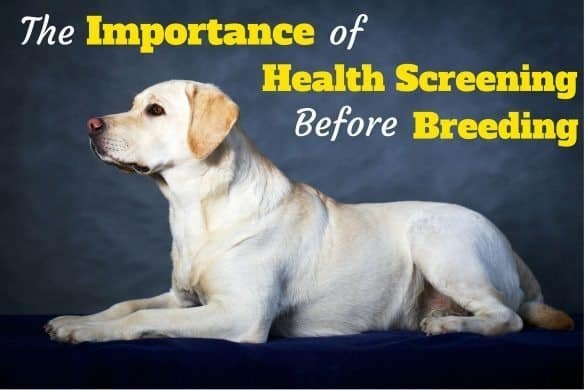 It can be food, bones, a dog bed, or even a crumb dropped on the floor. Some dogs will guard resources simply by using defensive body language, while others will growl or bark at dogs who come too close. Dogs with serious resource guarding issues will often stage an aggressive attack to prevent other dogs from threatening their possessions. If your dog is aggressively protecting resources from you or another person, please read this article. As I mentioned above, resource guarding is a normal canine behavior. It is partly instinctual, partly genetic, and also influenced by the dog’s environmental and situational stimuli. Before dogs were totally reliant on humans to meet their basic needs, they relied on aggression to ensure they had enough food to survive. The threat of losing a resource was a matter of life and death. Resource guarding dogs who have been integrated into family life are often insecure and unable to cope well in social situations. They consider other dogs a threat to their well-being and security. Any dog, no matter how well-bred can develop undesirable behaviors. Because resource guarding can be potentially dangerous, it is best to take steps to prevent the behavior before it starts. Here are some suggestions for preventing your dogs from resource guarding. Socialize your puppy to people, situations, and other dogs. Insecurity plays a big part in resource guarding behaviors. While your puppy is young, it’s important to expose them to as many new situations as possible so they are well-versed in the ways of the world. They should play with friendly dogs often, both in your home and in other environments. Be sure to expose them to dogs of many breeds, sizes, and ages. You can read more about puppy socialization here. Teach your dogs to be polite. Your dogs should always know to wait their turn at the food bowl, when entering and exiting the house, and even when playing with toys. Dogs without manners will start to expect everything they want right then and there, which could lead to problems later on. Feed and treat your dogs together. If your dogs show no signs of resource guarding, the best thing you can do to keep it that way is to feed them together, encouraging politeness with lots of praise. Periodically have your dogs sit together as you dole out treats to each one. Only give treats to dogs who are waiting patiently, and always change up which dog gets treated first. This teaches your dog that good things will come if he waits quietly. It also teaches them that other dogs are not a threat to their resources. If your dog has recently started resource guarding, it may not be a behavioral issue at all. Before you take steps to modify their behavior, be sure to rule out the following scenarios. Your dog isn’t getting enough to eat. Dogs who are constantly hungry will be a lot more protective of their nutritional resources. Be sure your dog is eating enough. If you feed your dogs together, make sure to watch them as they eat. It’s not uncommon for one dog to finish a bowl of food and then move in on their neighbor’s dinner. Your dog is ill or in pain. Rule out any medical issues, especially if your dog starts acting different without much warning. Your dog isn’t getting enough mental or physical stimulation. Dogs need to exercise their brains and their bodies to thrive, and dogs who don’t get enough stimulation will start acting out in all kinds of negative ways. Your dog is a puppy. That’s right — sometimes puppies will try out behaviors with people and other dogs to see what kind of response they get. Because this is a behavior that you don’t want to encourage, you should still follow the steps outlined in this article. Just keep in mind that your puppy is still learning the difference between right and wrong. If you’ve ruled out the above scenarios and your dog is still resource guarding, you’ll want to make a plan to change their behavior. While you are developing your plan, it’s important to keep your dog from patterning resource guarding behavior. The last thing you want is for one of your dogs to get away with bullying another dog with growls, lunges, barks, or bites. If these behaviors have the desired effect (the other dog shrinks back in fear or leaves the resource alone), then the aggressive dog will learn that those actions bring on successful results. That is where management comes in. While management will not solve the problem, it will keep things from getting worse. To manage your dog’s negative behavior, you will have to prevent as many incidents as you can. 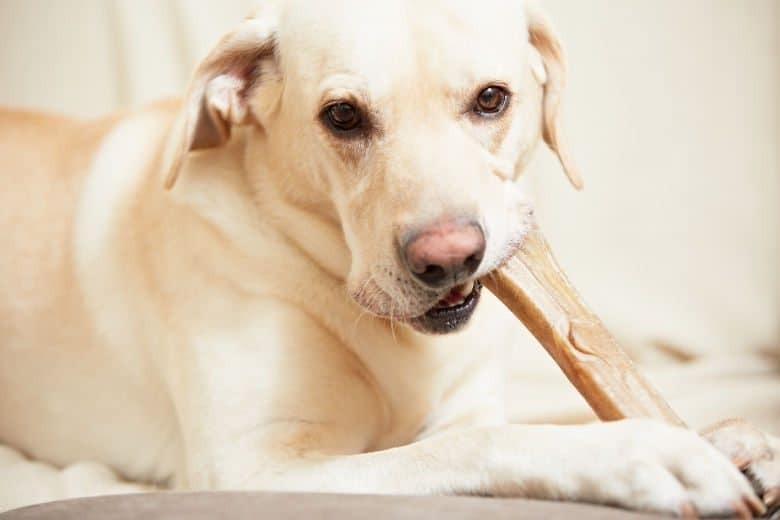 What that entails will depend on your dog and your situation, but it may mean feeding your dogs separately, removing all bones and toys from the house, and keeping your dogs crated when people are eating. You may also have to suspend visits to the dog park or other dog play-dates until the behavior is corrected. Before we talk about steps you can take to solve aggressive resource guarding, you should realize that this is a potentially serious issue that could be dangerous if not handled properly. If you think that your dog’s resource guarding may put another dog in danger, do not take it upon yourself to try and correct the problem. In this situation, your best course of action is to work with a professional. For more information about choosing a professional to work with your dog, please read Finding Professional Behavior Help by the ASPCA. Using positive reinforcement, desensitization, and counter-conditioning, you will be teaching the resource guarder, dog #1, to love it when dog #2 has access to a precious resource. Here’s a brief overview of the techniques. Positive Reinforcement – This technique allows you to use praise and food to reward your dog for a desired behavior. 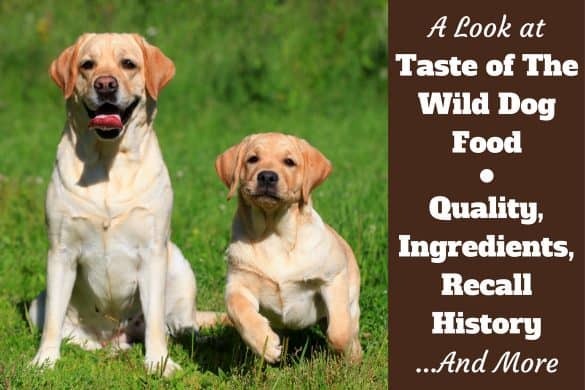 The secret, especially when working with Labradors, is to use high-value treats that will elicit a quick response from your dog. The Humane Society of the United States has a great overview of positive reinforcement training here. Desensitization – This is the process of gradually exposing your dog to controlled and modified situations where they would normally guard resources. Because you are controlling the situation, you expose your dog gradually and at very low intensities or distances so that you don’t trigger a negative response. Over time, your dog will become accustomed to the stimuli and negative responses will dramatically decrease. Counter-conditioning – This technique goes hand-in-hand with desensitization and will focus on changing the dog’s emotional response to stimuli. By changing the negative response to a positive one, you will also change the negative behavior to a positive behavior. You can read more about counter-conditioning and desensitization and how they work together to correct negative behaviors in this article by the Animal Humane Society. Correcting resource guarding behavior will take a lot of patience and practice. The tricky difference between correcting behavior directed at dogs as opposed to humans, is that you will be dealing with two unpredictable variables. For that reason it’s a good idea to use dogs that you know well as triggers for your aggressive dog. Obviously if you live with a pack of dogs, you will work as a family. If your dog is the only dog in the household you will have to get creative with finding other dogs to help you out. Observe your dog’s behavior around other dogs and write down what you see. Make note of what your dog protects, as well as when and where he protects it. You may find that he only protects his food bowl in the kitchen at 7 am, or you may find that he guards his ball no matter where he is. Knowledge is power in this situation, and you will only be able to correct the behavior if you know what it is you’re correcting. Every situation will be different and you’ll have to work through each situation separately, depending on what your dog needs to work on. For a sample scenario, we will use a two-dog household where one dog guards the food bowls. Start with both dogs on a leash and the food bowl in the middle of the room. You will need a human helper and high-value treats that are more desirable than the food in the bowl. Dog #1 (the resource guarder) can sit or lie down near the bowl. Dog #2 should be just outside the room. Have your helper come into the room with dog #2. How close can dog #2 get without a negative response from dog #1? The secret is to catch dog #1 before he responds aggressively and praise him lavishly with high value treats. Dog #2 can also be praised and treated by his handler as needed. Ask the helper with dog #2 to leave the room. When they leave you should ignore dog #1 until they approach again. 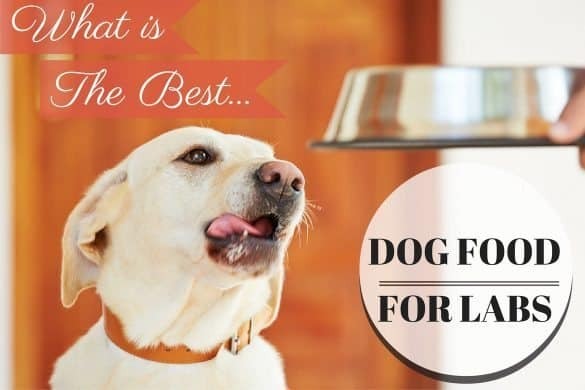 The goal is to condition dog #1 to expect a treat and praise every single time another dog walks toward the food bowl. Who needs dog food when you’re getting so much attention, love, and treats? When dog #1 is giving you a positive response every single time dog #2 approaches, you can begin to decrease the distance between the dogs. Be sure to offer high-value treats with each positive response. For a negative response, go back a step or two, working this routine with a greater distance between dogs where there is no negative reaction. Then gradually progress again. When they can reliably sit next to each other without aggression or defensive body language, you can try working with dog #2 off-leash. It may take days or weeks to get to this point, and you should still have someone helping out so that both dogs can be managed if the situation escalates. Step 6: Practice, practice, practice! Every situation is different and you may need to work on resource guarding of toys, bone chews, beds, etc. in order to achieve success. Start small, gradually decreasing the distance between dog # 2 and the resource. Eventually, you want dog #2 to be able to take the resource while you praise and treat dog #1. Ideally, you should work on this every single day until both dogs think of it as a really rewarding game. Teach your dogs to drop-it and leave-it. This will be very helpful when teaching them to share resources. You can work on taking a toy from one dog and giving it to the other and vice versa. Keep high-value treats handy all the time. 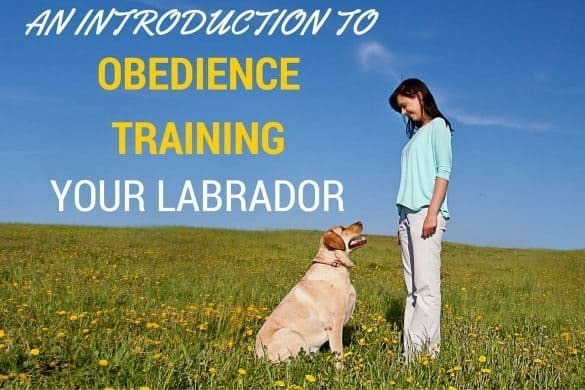 While you are working with a dog who guards resources, you should always be ready to praise and treat positive behavior, especially if you live in a multi-dog family. Work slowly and methodically. Do not expect to correct this behavior overnight. When you aren’t actively working with your dog, be sure to continue managing the negative behavior by keeping resources out of sight. You don’t want your dog to suffer a setback when you least expect it. Be prepared for extinction bursts. Speaking of setbacks, they are a normal part of behavior modification. An extinction burst occurs when an undesired behavior temporarily gets worse before it gets better. When working through extinction bursts, the best thing you can do is just that – work through it. Your dog is making progress. I promise. Just keep going. Reinforce positive behavior with games. As your dog’s behavior improves, you can use coveted resources to practice the skills they have learned. Try hiding a ball or toy in the house, and praising your pups when they bring it to you. Crate your dog if you can’t monitor a situation. If there is a possibility that your dog will guard resources while you aren’t watching, the best thing to do is to crate them until you can keep on eye on them. This article will help you with crate-training a puppy. You will find information about crate-training an older dog here. Do not punish your dog. This will only make your dog insecure and fearful, which will usually lead to more aggressive behavior. Do not ignore the behavior. Because resource guarding is normal, it can be tempting to accept the behavior as long as it isn’t serious. You will not, however, be able to manage every single encounter your dog has with other animals, and all it takes is one aggressive outburst for a dog or person to potentially get hurt. Do not generalize. Just because a dog learns not to guard the food bowl, does not mean they won’t continue to guard their bed or toys. You will have to work through each and every situation systematically, and the course of action will be different for every dog. Do not hesitate to call a professional. Animal Behavior Specialists are trained to deal with issues like resource guarding. There’s a good chance they will have worked with hundreds of dogs that have the same behavior issue as yours. Use them and their knowledge to your advantage. Resource guarding between dogs is a totally normal, but unacceptable behavior. Dogs who live in a family pack must live by the rules you set, and eliminating resource guarding will keep your dogs and your family safe. Modifying a negative behavior takes patience and dedication, but the results will be well worth the effort that you and your dogs put into it. Keep in mind, that not all behaviors will disappear entirely, and you may always have to manage the behavior to some extent. Your hard work will be rewarded with reduced tension between your dogs, and a home environment that is safe for both residents and visitors. We had a family member come on Easter with their old blind dog. I gave them a bag of chew treats and I did not realize they gave both our dogs one each. I have a 11 mnth old dog and a 3 month old puppy and as soon as the puppy sees the older dog start to play with a toy he runs over and takes it from him even if he has his own toy, but sometimes they will both play with the same toy. When we throw a toy for the older dog the puppy runs and takes it away, and sometimes the older dog will go get a toy and tease the puppy with it just so he will play. Im not sure how to react to this because they eat out of each others bowls and get along fine but sometimes I feel like the little one is being aggressive and hogging all the toys. 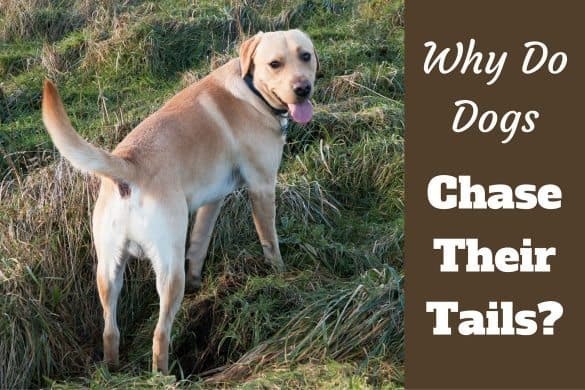 Great information about how to stop your dog from aggressive Resource Guarding. I’m so thankful for it. I was almost at my wits end with the problem with my own dog. It’s only been two (2) days since I started with the positive step by step training with my dog to prevent the aggressive resources guarding and there has been a huge change with my dogs attitude. Still not perfect, but considering the short amount of time I’ve been doing the behaviour training with my dog, I wouldn’t be surprised if my dog has completely stop with the A.R.Guarding. So thank you so much for the info.